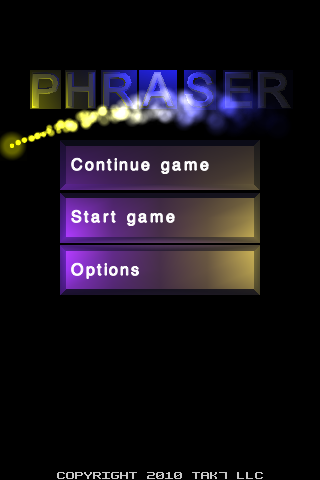 Phraser is an action word game for the iPhone, iPod Touch and iPad. Phraser is an action word game. 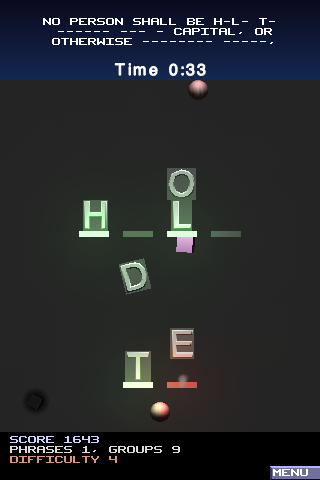 You drag letters around the screen and place them on slots until you form the correct word(s). The words are part of a phrase. When all word groups of the phrase are done then the phrase is solved and another random phrase is chosen from the category you are playing. 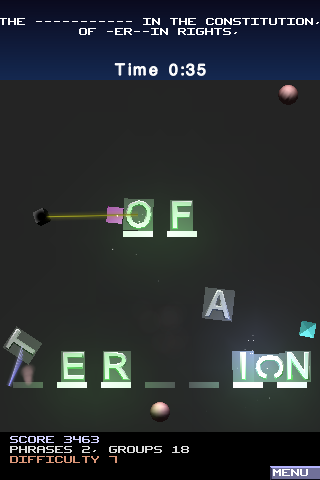 Phraser uses a physics engine, so letters bounce and spin as they collide with other letters, slots, enemies and the walls. The game ends when the timer counts down to zero. Extra time is added for each letter put in the correct slot and each word group finished. The time is reset when a new phrase is started. A letter over a correct slot will be pulled into place and the slot's green light will turn on. A letter over an incorrect slot will be pushed upwards and the slot's red light will turn on. The difficulty level increases as groups are completed. The higher the difficulty the faster enemies are created. There are sphere shaped helpers at the top and bottom of the play area. 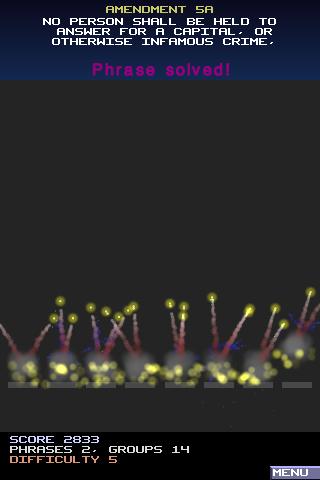 They will shoot a laser at nearby enemies and will destroy them with two shots. They can be dragged around to put them near enemies or rammed into an enemy to destroy it. Enemies can also be dragged out of the way or to a helper. There are five type of enemies. They attempt to move your letters around and get in the way. They will normally seek the closest letter. Bomb - Explodes when near a letter. The blast pushes nearby letters away. Graviton - Pulls letters into itself. The closer the letter the stronger the pull. Popper - These drift around. About once a second they will ram the closest letter. 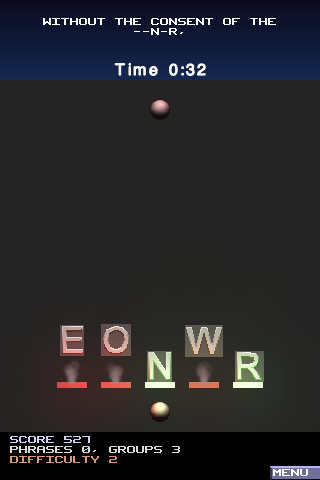 Pulser - Push into letters with an increasing force, then will back away and repeat. Pusher - Constantly push into letters. Bible - Old and New Testament verses. US History - Sections of the Declaration of Independence and Bill of Rights. Word - Groups of common 3 letter words.